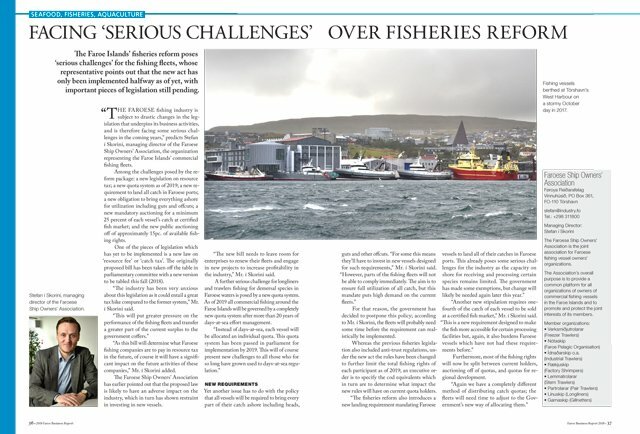 The Faroe Islands’ fisheries reform poses ‘serious challenges’ for the fishing fleets, whose representative points out that the new act has only been implemented halfway as of yet, with important pieces of legislation still pending. 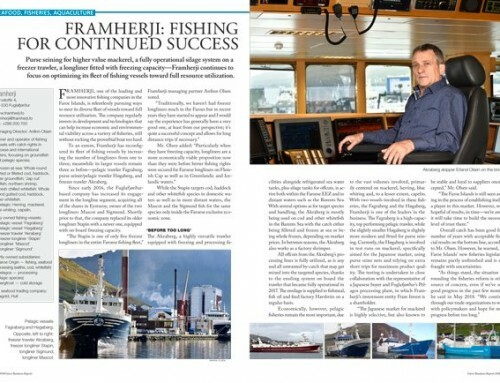 “The Faroese fishing industry is subject to drastic changes in the legislation that underpins its business activities, and is therefore facing some serious challenges in the coming years,” predicts Stefan í Skorini, managing director of the Faroese Ship Owners’ Association, the organization representing the Faroe Islands’ commercial fishing fleets. 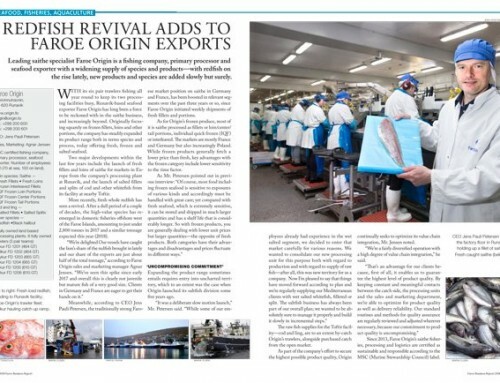 Among the challenges posed by the reform package: a new legislation on resource tax; a new quota system as of 2019; a new requirement to land all catch in Faroese ports; a new obligation to bring everything ashore for utilization including guts and offcuts; a new mandatory auctioning for a minimum 25 percent of each vessel’s catch at certified fish market; and the new public auctioning off of approximately 15pc. of available fishing rights. One of the pieces of legislation which has yet to be implemented is a new law on ‘resource fee’ or ‘catch tax’. The originally proposed bill has been taken off the table in parliamentary committee with a new version to be tabled this fall (2018). “The industry has been very anxious about this legislation as it could entail a great tax hike compared to the former system,” Mr. í Skorini said. 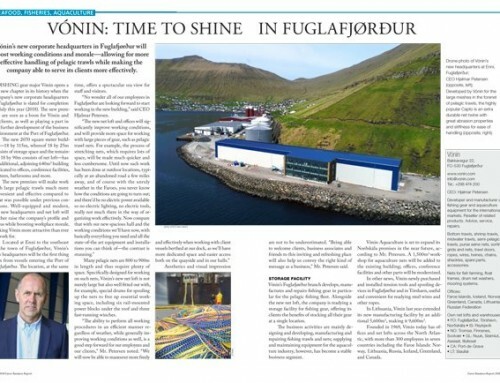 “As this bill will determine what Faroese fishing companies are to pay in resource tax in the future, of course it will have a significant impact on the future activities of these companies,” Mr. í Skorini added. The Faroese Ship Owners’ Association has earlier pointed out that the proposed law is likely to have an adverse impact on the industry, which in turn has shown restraint in investing in new vessels. 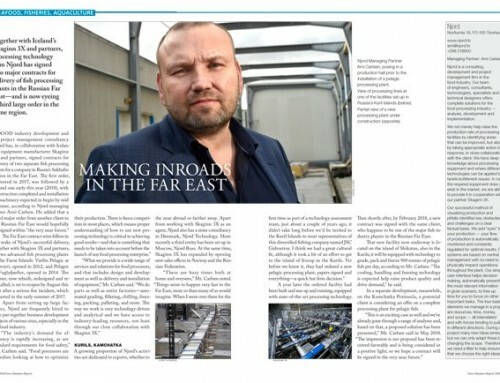 “The new bill needs to leave room for enterprises to renew their fleets and engage in new projects to increase profitability in the industry,” Mr. í Skorini said. 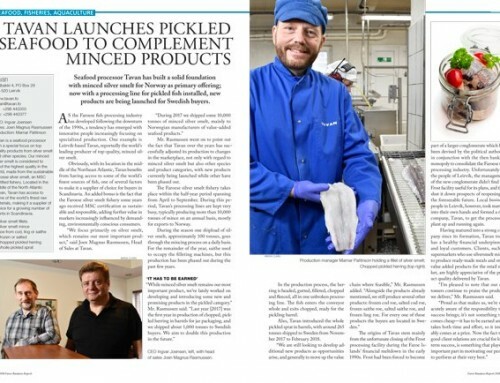 A further serious challenge for long­liners and trawlers fishing for demersal species in Faroese waters is posed by a new quota system. As of 2019 all commercial fishing around the Faroe Islands will be governed by a completely new quota system after more than 20 years of days-at-sea effort management. For that reason, the government has decided to postpone this policy; according to Mr. í Skorini, the fleets will probably need some time before the requirement can realistically be implemented. Whereas the previous fisheries legislation also included anti-trust regulations, under the new act the rules have been changed to further limit the total fishing rights of each participant as of 2019; an executive order is to specify the cod equivalents which in turn are to determine what impact the new rules will have on current quota holders. Furthermore, most of the fishing rights will now be split between current holders, auctioning off of quotas, and quotas for regional development.